Saturday and Sunday's rides came at a cost. Saturday Kevin and I took a 257 Horseshoe Bay for The Gleneagles Skatepark. The park is a clover leaf bowl, a low bowl that I can't get out of and a set of dirt jumps and log rides. The ride never really ended. It followed the setting sun to Lighthouse park, a sugar binge at dark rural bus shelter and a slow haul out of downtown interrupted by a hamburger on Main street. By 11pm I was asleep on Kyles couch. Kyle and Sheena don't wake you up when you sleep on their couch. Fair I guess. I made it home in time to put off installing a front brake until the morning. I slept late. I made it to Lyles van on time and spent the drive up to Fromme filled with excitement for trail riding and fear that I may be on the wrong bike for the ride and apprehension and coffee. Things went well. 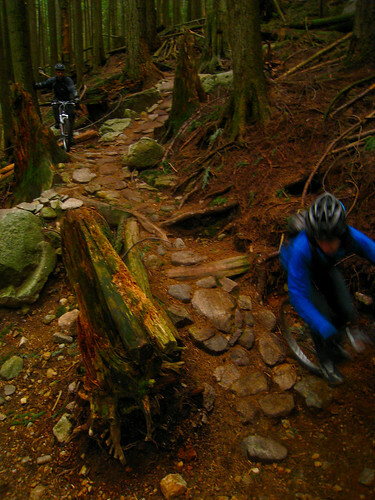 The trails stayed mostly dry. I kept my speed mostly under control. When it started to rain we were already on a lower loop with less elevation change. The showers left thin clouds behind them and the moss and the buds and the rocks gleamed in filtered sun. One gleaming rock destroyed Morgan's derailleur and another was used to hammer it back. 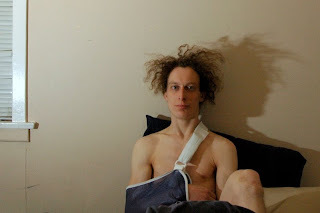 Monday morning with my left hand on a pedal and my right arm reaching for a left shifter I dislocated my right shoulder. Campy. I can't think of another way for a workday to turn into a walk in the woods with two of my favorite people. Any work day could be like that. People are enjoying themselves every day. Some of them work in the ER. Some live at UBC and go for walks in the afternoon. Some ride the bus with one arm hopped up on painkillers. They just smile. It may be the cherry blossoms or the Propofol but I feel like spring is coming. It's warm, in fact it may cause a burning sensation at the point of injection. Polo Bike is built right. I'll give it a couple of weeks but until then it makes an excellent injury bike grocery bike and lock up downtown bike. Tech alert: tech77 lever pulling a road cabledisk brake. Norco Monterey fork, dropouts filled to make a 397mm axle-crown. 165mm cranks. 35C tires. Worn out brake track openpro rims laced to saved from the bin hubs. Suntour Thumbie pulling a bent Ultegra 10s derailleur with the cable on the other side of the pinch bolt. Kids bike derailleur guard. 6 speeds of a 7sp cassette spaced over to put a 24t polo cog at optimal chainline.